Following on from the news we broke earlier this week (HERE) about DIE LAUGHING we can officially bring you the poster (to the left) and below you can check out the official trailer. 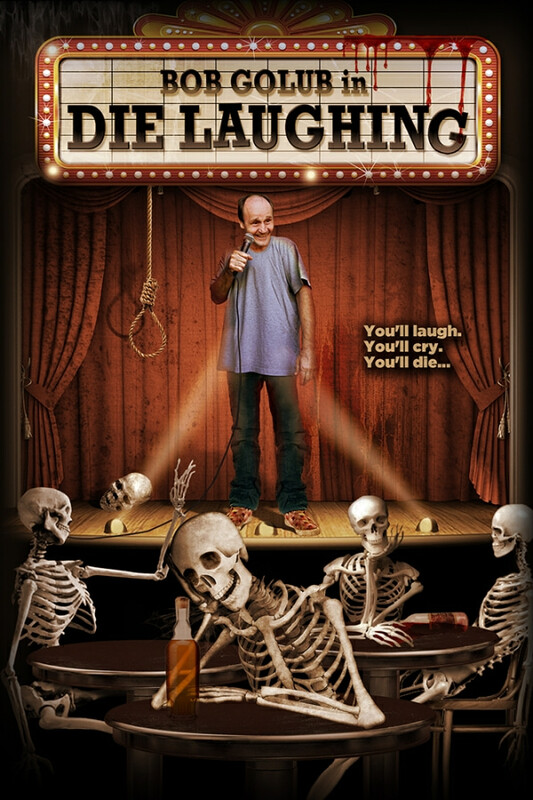 Bob Golub’s DIE LAUGHING is available today, on major digital platforms! The film stars and centers around real life actor/stand-up comedian Bob Golub. He doesn't just kill the crowds with his jokes; he sometimes just kills them. He answers an online ad placed by a documentary filmmaker searching for people who have committed an actual homicide. Golub responds and insanity and murder ensue as we get an inside look at this funny guy's demented, murderous, and darkly comedic world. DIE LAUGHING is a completely improvised work from the minds of Golub and his filmmaking partner-in-crime, Mark Mannschreck. Inspired by the likes of the cult hit Man Bites Dog, this pseudo-documentary was shot over many months on the road with Golub using a single camera in a raw, cinéma vérité style. Terror Films will release this film across multiple digital platforms. Platforms include: iTunes, Amazon Instant/Prime, Google Play/You Tube, X-Box Live and many others. The release begins with North America and will be followed by a worldwide digital release on iFlix.